There is always that one person you know with too much stuff for their own good. That person in my life is my Grandma.This woman has everything and anything that you could find in a thrift store. Just when I thought I had seen everything that she owned, out comes the golden mirror. This thing was pristine and as much as the gold is beautiful (and plastic), I am just not a gold type of girl. Well, my Grandma was downsizing and guess what was now mine? The golden mirror! There was no way I was letting it go, however there was also no way I could enjoy it as is. Below I will show you the steps I took to take this tacky plastic mirror back from the 80's and one of the favourite things I own! Here she is in all in all her glory! Look at how that gold plastic shines! First I made sure that every nook and cranny was well cleaned and dried in order to make it ready for spray paint. Next, I took tape and made sure I made clean lines all the way inside on the mirror to ensure no bleeding onto the glass! protect the mirror - this is a no paint zone!! I decided to use Rust-oleum Forged Hammered in "Antique Pewter"
I decided to go for something with a bit of texture so it didn't end up flat. 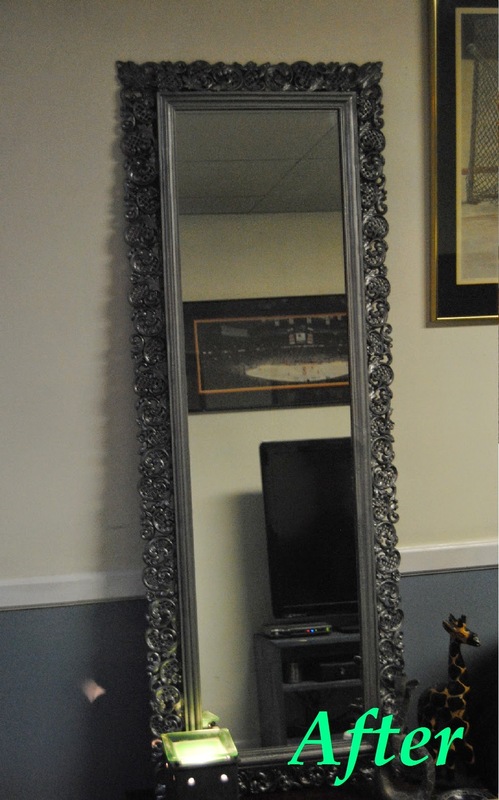 The pewter would add a nice modern touch and the hammered look will make the detailing in the mirror look even better. Some would tell me to use a primer but honestly it wasn't that hard to cover the gold and because it was plastic, the paint really stuck to it. I left the paint sit 24 hours between each layer just was a precaution because it was fairly cold outside so I wanted to make sure it had enough time to dry. there was no such issue!! It turned out great! Look how gorgeous it looks! it is probably one of the cheapest DIY's I've ever done! Beautiful detail is still there, just not as gaudy now that the gold is gone! was take a silver sharpie and cover the gold and now I can't even tell where those spots were any more! Here again is the before and after! Let me know what you guys think!